Compliment: For one(1)- way transfers we offer complimentary waiting time of 15 minutes from the time of booking, post this 15 minutes waiting time, there will be a $10 surcharge applicable for every 15 minutes block. Arrival Transfers are packed with waiting time of 60 minutes from the time of flight lands, post which there will be a $10 surcharge for every 15 minutes block. Hourly Charter Bookings at least requires minimum of 3 hours to be booked. $10 midnight surcharge will be applicable from 0000Hrs - 0600Hrs. Additional Stops would be chargeable at $10-$15 respectively depending on the distances. Every payment made by credit card is applicable to have 10% surcharge. Travelling from 00:00HRS to 06:00HRS? Do you require a Meet & Greet Service? 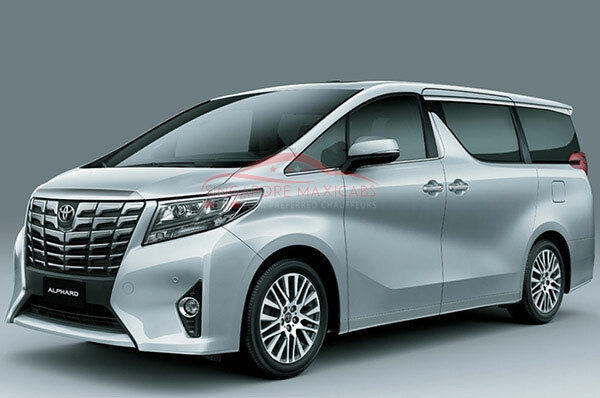 Our 6 Seater Limousine Services, 6 seater taxiSingapore using either a Vellfire Limousine or Toyota Alphard which are popularly known as king around Singapore. When required it serves as an executive vehicle known for its style and its comfort level. Most suitable for you and your clients on a larger capacity traveling together for events and meetings. 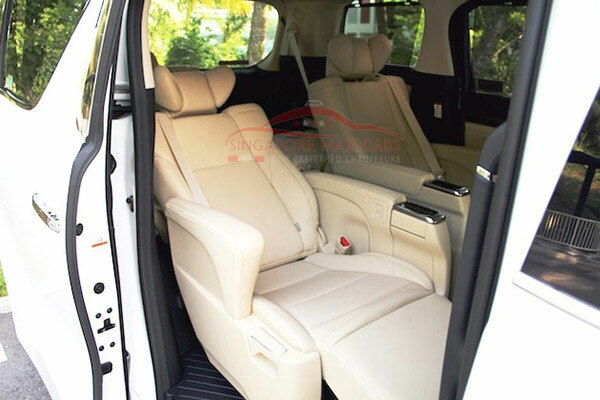 The 6 Seater Limo Cab is an ideal choice of limousine Singapore. Be it for an extended family get together and family functions such as weddings. 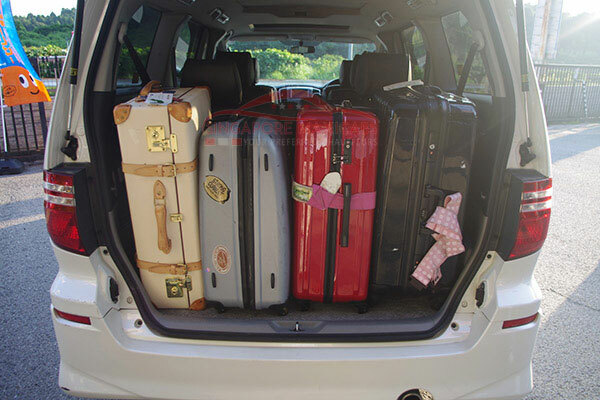 Generally, our 6 seater maxicab comes with 6 seats and a medium sized cabin to store luggage and mid-sized items. These Maxicab for six people comes in high specifications such as a sunroof, rear air-con and ottoman leather seats for maximum comfort. When you book a 6 seater taxi Singaporefor an airport transfer or your airport pick up (arrival), we also provide a complimentary waiting time. Meet and Greet services where the driver will personally hold a card with the requested name to be displayed and will bewaiting outside the belt area that you will come from. Our 6 seater taxi booking Singapore is guaranteed to make your guests, and yourself feel pampered by the most sophisticated service that we provide to you. We also cater to 6 seater cab booking for departure to the airport as well. If you require the vehicle to be with you throughout the day, you could book our 6 seaters maxi cab hourly booking service. Our 6 seater taxi Singapore is a excellent choice for 6 passengers. 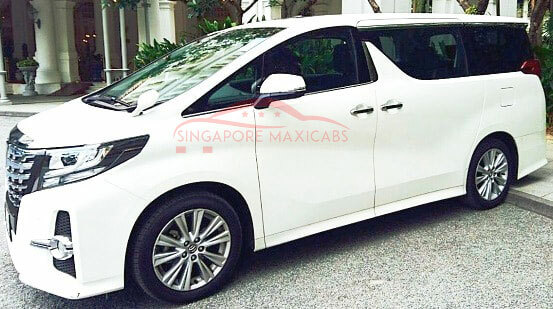 Singapore Maxi Cab assures a 6 seater taxi in 15 minutes to your doorstep from the time you book our maxicab service island wide. Look no further and book a 6 seater maxi taxi from us right away via our maxi cab online booking portal or give us a ring for a hassle-free 6 seater maxi cab booking. www.singaporemaxicabs.com.sg your friendly transportation partner. 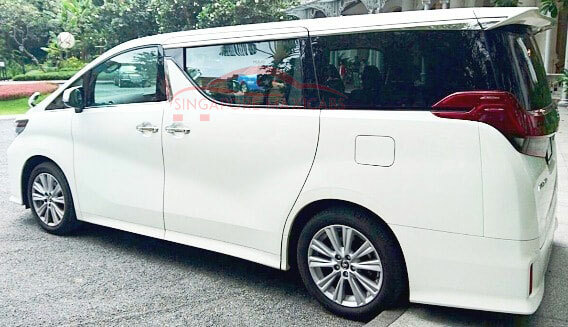 Reasons for the 6 Seater Taxi to be popular for booking in Singapore is because of the luxurious VIP feel it gives to each passenger traveling inside. Ideally the 6 seater taxi to airport would be must try for each and everyone who would want toexperience a difference of maxicab. © 2017 - 2019 SINGAPORE MAXICABS (Reg No. 53374808M). All rights reserved. Use of this site constitutes acceptance of our Terms and Conditions.